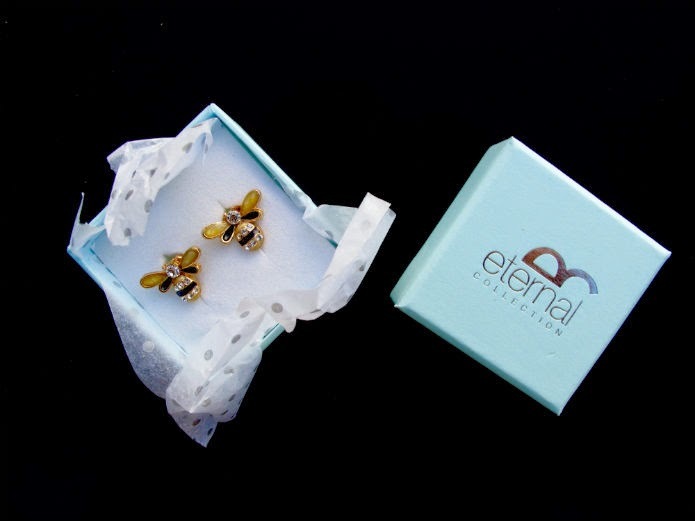 This is my second collaboration with Eternal Collection, and I freely admit, when my Honey Bee Enamel and Crystal earrings arrived, I let out a little squee of delight. If you've been reading a while, you'll already know that the way to my heart is to basically slap an animal on anything. If that animal (okay fine, insect) happens to be a 3-D rendition with gold, enamel, and bling...well. That is just beyond. 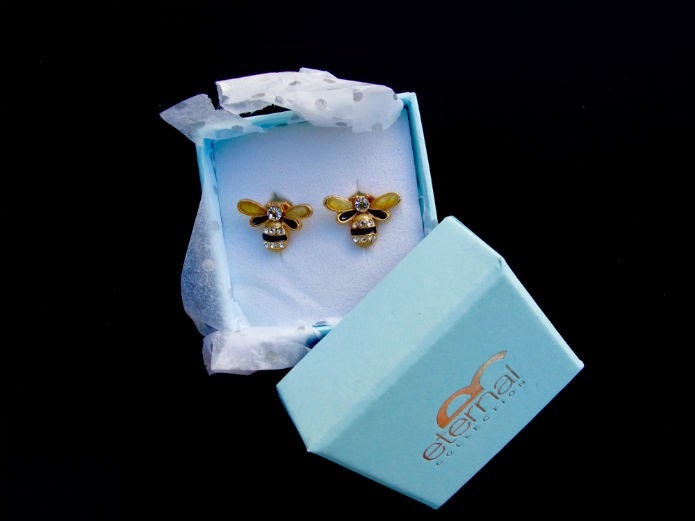 There's just something so delightfully retro about these bee earrings, not the least of which is that they are actually clip-ons. 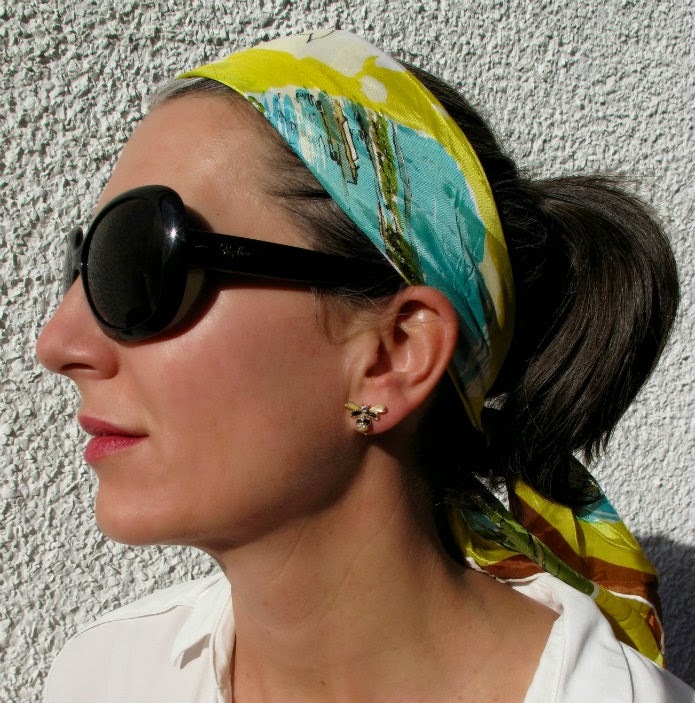 Although I have pierced ears, I often find myself of two minds when faced with the prospect of a lovely pair of earrings that turn out to be clip-ons (this happens a lot if you like to hit the vintage shops). On the one hand, a clip-on earring will always sit well (if it fits properly) and gives your look a polished, ladylike feel. They can look especially edgy when worn with something dressed-down like a white tank and ripped jeans. However, I always had this sort of foreboding sense about clip-ons, as I'm sure many of you do. Most of them will be based on experience. I cannot think of a woman I know who does not share in the experience of a painfully tight clip-on earring, or a too-loose one that never hangs right (if it hangs on at all). And remember those screw-on earrings? Omigod. I can't even with the throbbing ear pain. As it turns out, Eternal Collection knows a thing or two about clip-on earrings, including how to adjust them to actually fit your ears. 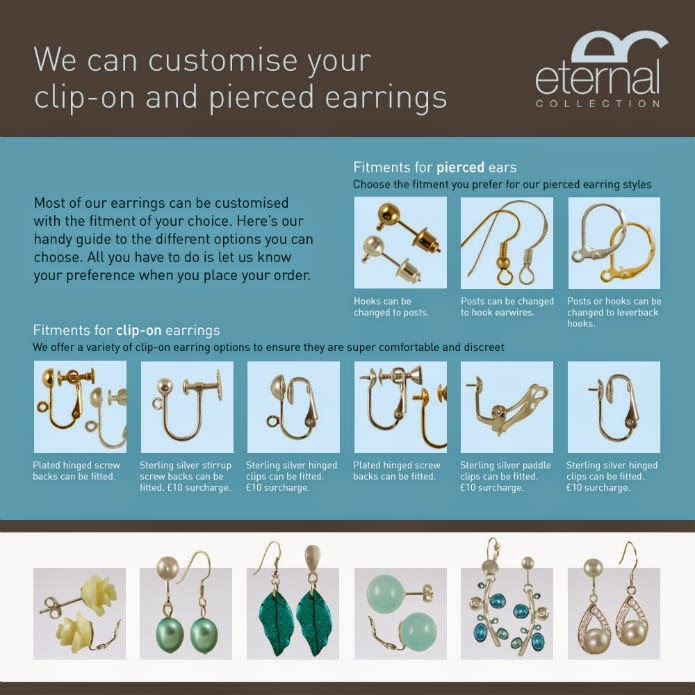 They've made videos showing you exactly how it's done, and they will even customise their clip-on earrings (and their pierced earrings, for that matter) with the fitting of your choice! This is great news, as many times I have walked away from a pair of earrings I really liked because I didn't like the back fittings. What's more, I imagine you could even use the techniques in the video to adjust any of your your omega-back pierced earrings! This is like a revelation for me, and the only thing I can even think of to say is why the heck didn't someone show me this sooner! ?